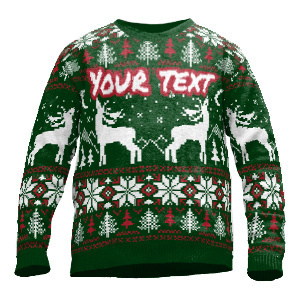 Edit design Custom christmas jumper , or create your design from scratch. Custom knitted christmas jumper with your design knitted in. Use custom text, cliparts, icons, names, logo and photo. Make it ugly, nice, make it your personal christmas jumper from 1 pc already. Custom sweater maker from the sweater central, Germany.